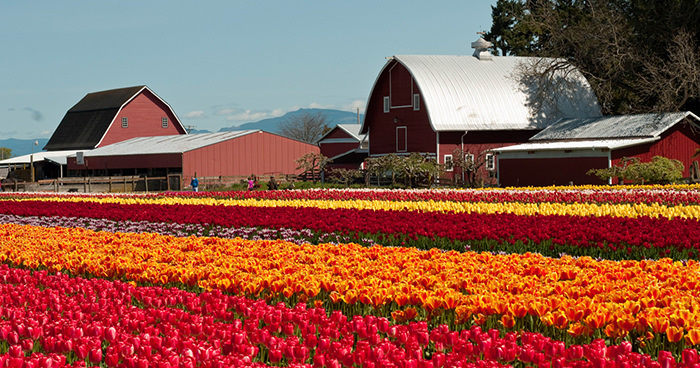 Shutter Tours is the most highly rated tour company in Washington State for Tulip Festival Tours. Not only do we provide the best Tulip Festival Tours but we have developed strong relationships with all the farmers and growers to provide you with the best experience that no other company can match. We have been a proud sponsor of the Skagit Valley Tulip Festival since 2012 and are excited to share this amazing trip with you. We offer Downtown Seattle Sheraton hotel pickups at 1400 6th Avenue at 7:30 AM (return by 5:00 PM). We also pick up at the Swamp Creek Park and Ride in Lynnwood, WA between 8-8:15 AM (return by 4:30 PM). All garden admission fees are included in your ticket price with VIP entrance to enjoy the gardens. 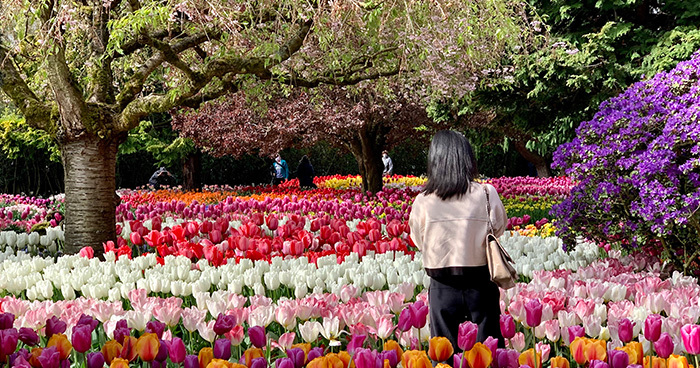 Your trip with us will also include photo tips to take better photos while you enjoy the gardens and tour narration to learn more about the Skagit Valley and tulip growing process. Shutter Tours has also arranged VIP entrance to the gardens saving you time standing in line to enjoy the tulips more. We also know how to avoid the long traffic lines and take care of the details so you can have an enjoyable day with us. 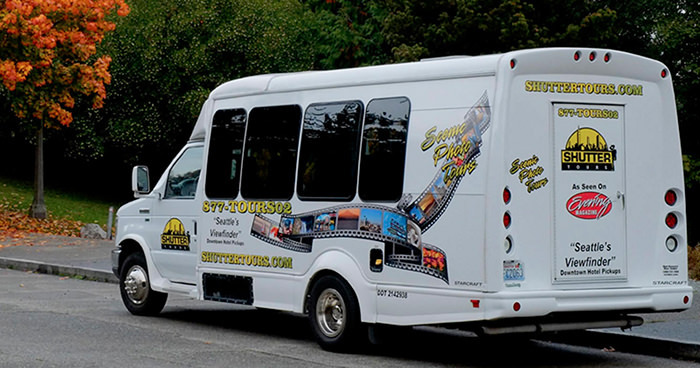 Our tour begins in our comfortable custom ordered mini coaches as we journey through scenic farmlands and across the Skagit River with Mount Baker as a backdrop. Our first destination will be the drive past the tulip fields in Mt. Vernon Washington. 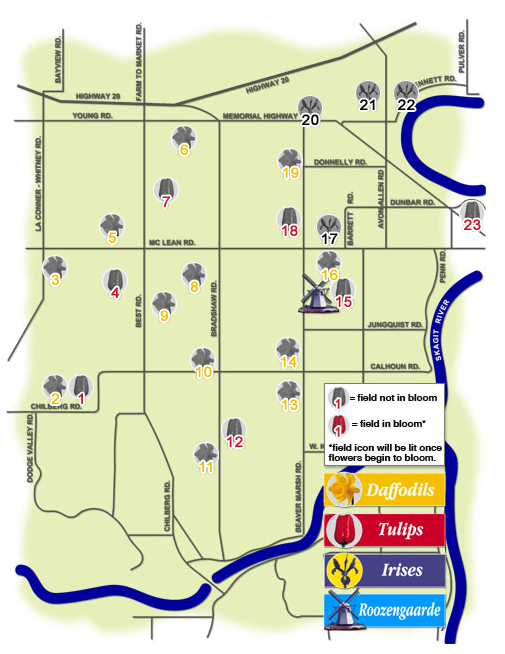 Here you will see your first colors of the tulip and daffodil fields when in bloom. An exciting introduction of what is to come upon your arrival at the Tulip gardens. We then visit the beautiful flower gardens at Roozengaarde, owned by the Roozen family – bulb growers in Holland and the United States since the early 1700s. Growing in their display garden you will have the opportunity to photograph 90+ tulip varieties in addition to many more varieties of daffodils, hyacinths, crocus, & specialty flowers. Planted just behind the garden is a large tulip field filled with seemingly endless rows of color. Don't forget to pick up their free catalog where you can buy over 140 varieties of bulbs. Shutter Tours includes the admission fee to this garden as part of your tour price. Check out our blog post to learn more about the planting season at Roozengaarde. Avoiding the large, mid-day crowds at the gardens, we then set out to historic waterfront village of La Conner, Washington. 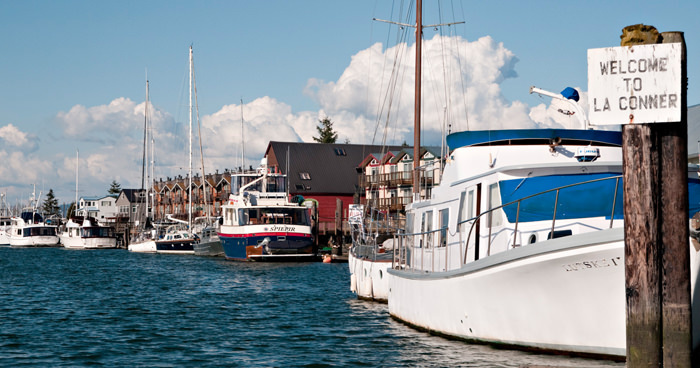 This picturesque town was voted both the "Most Romantic Getaway" and "The best town to capture the Northwest spirit". With 2 hours available here, you will have time to shop at many of the exciting stores including the Pelindaba Lavender store and The Wood Merchant and enjoy a meal at one of the many award-winning restaurants such as Nell Thorn and the Calico Cupboard Cafe' and Bakery. Tulip Town is a perfect place to stop after lunch with a wonderful indoor display, art gallery and multi-colored fields that explode with colors. The fields planted here have alternating colors about every ten rows to make your afternoon one you will not forget. Admission fees to the gardens are included in your ticket price. 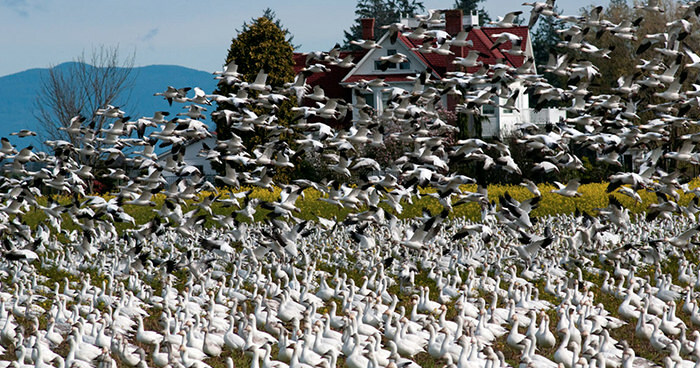 Along the way, we might have the opportunity to stop and see the Snow Geese as they make their way back to their Summer breeding grounds off the coast of Siberia on Wrangel Island. This is a sight in itself, and we'll be sure to scout ahead of time to see where the geese might be. The ticket cost is $99.00 per person + tax/fees. We offer Downtown Seattle Sheraton hotel pickups at 1400 6th Ave at 7:30 AM. We also pickup at the Swamp Creek Park and Ride in Lynnwood, WA between 8-8:15 AM. We offer Downtown Seattle Sheraton hotel pickups at 1400 6th Avenue at 7:30 AM. We can also pick up at the Swamp Creek Park and Ride in Lynnwood, WA between 8-8:15 AM for those that are local or who have a rental car. Children are of course welcome on tour. Due to the popularity of this tour, we charge the same price for all tour participants regardless of age. We do not provide car seats for infants and they are not able to sit in a seat alone or on a parent's lap. Please bring a car seat and let us know in advance, so we can put you on a bus that has a proper seat belt system for these seats. Please call us at 425-516-8838 if you have questions in this regard. This is all dependent on Mother Nature of course. Keep in mind there are different variety of Tulips, with early, mid and late blooming time frames. We talk to the growers as the season progresses to optimize our schedule for the best viewing dates. Yes, you can get a refund up to 72 hours before your tour date (You will be charged a $15 cancellation fee per ticket, however) Cancellations under 72 hours will not receive a refund and will be charged the full ticket price. Please see insuremytrip.com for trip insurance. Lunch is not provided, however, our 2 hour stop in La Conner offers many award winning restaraunts for you to choose from. Our first pickup at the Downtown Seattle hotel pickup at 7:30 AM and we drop-off at between 4:30-5 PM, depending on traffic. Do you cancel if not enough tickets are sold? Nope, never. Tour companies may contact you before the tour and cancel because they have not sold enough tickets. Our policy is once a tour is booked we will fulfill our obligation to you so that you may enjoy the tour you have paid for despite the number of tickets sold. If just one person books a tour we will still operate, it's the right way to operate our business.